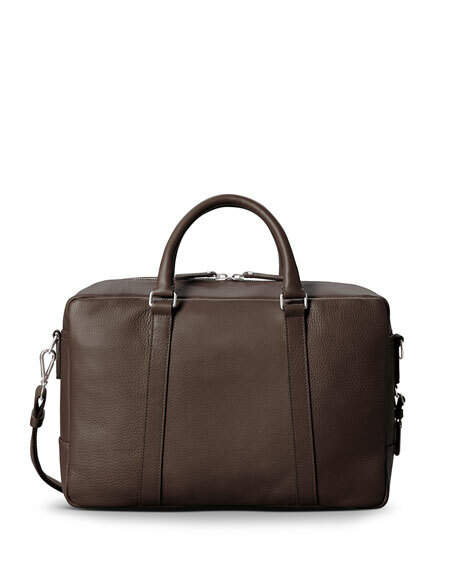 Shinola slim briefcase in signature leather. Inside: three pockets, one laptop case (fits 15"). 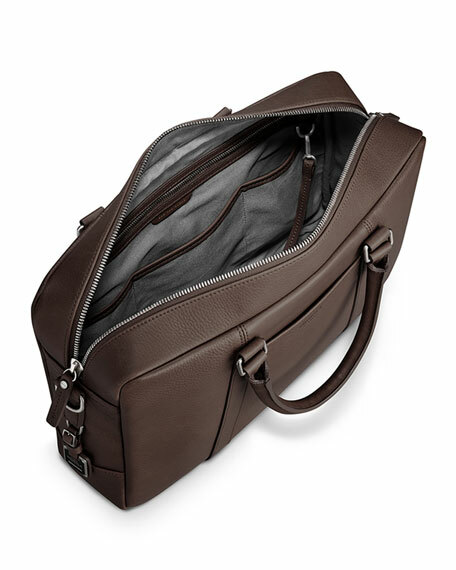 11"H x 16"W x 4"D.
Built in the United States with American leather and other US and imported materials. A Detroit-based company dedicated to bringing world-class American manufacturing jobs back to this country, Shinola believes that products should be well made and built to last. The Shinola line offers versatile and modern men's and women's watches in classic styles. Signature styles include The Runwell, The Birdy, The Brakeman, The Gomelsky and The Canfield. Each watch is hand-assembled in Detroit from the finest Swiss and other imported parts. Leather accessoriesincluding card holders, belts, phone cases, and moreround out the line. 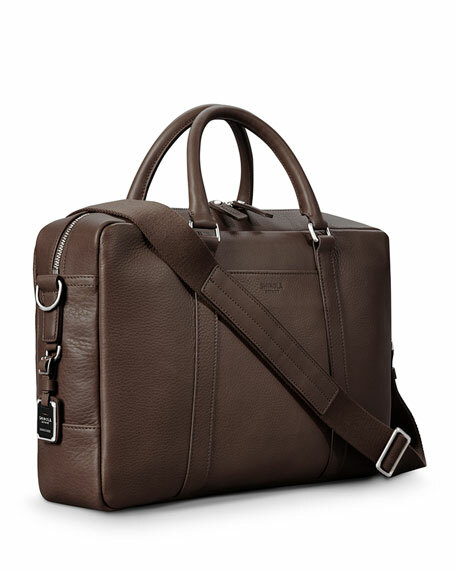 Berluti mini Venezia leather briefcase with engraved script. Rolled top handles with rings. Zip-top closure. Front exterior zip pocket. Inside, two flat pockets and one wide zip pocket. 10.25"H x 15.25"W x 2.75"D. Made in Italy. dunhill calfskin leather folio case, from the Cadogan Collection. Designed to hold documents or laptop. Palladium-plated brass hardware. Low-profile top handle, 1" drop. Zip-around closure. Exterior zip pocket. Interior, three slip pockets; padded laptop pocket. 11.5"H x 14.3"W x 0.8"D. Made in Italy. dunhill printed calf leather bifold wallet. Logo detail at bottom center. Two bill slots, eight card slots. 3.5"H x 4.5"W x 0.5"D. Made in Italy. Frye "Logan" briefcase in antique leather with golden hardware. Leather top handle; removable, adjustable crossbody strap. Flap top with double-buckle closure. Interior: laptop compartment, slip pockets, key ring clip. Approx. 10"H x 17"W x 4.5"D. Imported of Italian material.